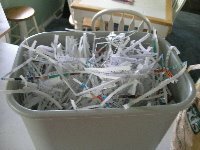 As I wrote yesterday, I’m still shredding all the crap that should be shredded. Everything from old check stubs, credit card offers, bill stubs, bank statements, and old checks. I have decided to set aside 30 minutes every day to get rid of all the stuff that has piled up for the last few years. 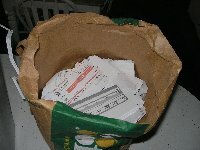 Here are the pictures… The first is a can full of shredded documents. And that last one shows what remains to be shredded. While talking with a friend of mine last night, I found out that she just throws stuff away. Yeah. In this day and age of identity theft, she simply tosses everything into the garbage without any thought of anyone rummaging through her trash for such tasty morsels. She’s a very smart woman and I found her indifference surprising. I’m fairly overprotective about sensitive information. Cell phone offers where I’m pre-approved… Goes to the shredder. Any pre-approval, I don’t care if it’s an offer for cat food, it’s going in the shredder. I’m probably too careful. But I wouldn’t be surprised one day to find that I’m the victim of identity theft while she’s still tossing her information in the trash and remaining untouched by thieves. I finally bit the bullet yesterday afternoon and headed out to Ciener-Woods Ford to get my oil changed. It’s just one of those things that I absolutely hate doing. That’s because it takes away from things that I want to do. I received two flicks from Netflix and 2 discs of Buffy The Vampire Slayer and I had no time to watch them. When I got off from work, I got home and fired up Elizabeth on the DVD player. And right from start, the director reeled me into the film. The shots were unusual and filled with symbolism. The film is about Queen Elizabeth’s rise to power and her unwavering will to run England as her father’s (Henry VIII) daughter. She never cowered because she was a woman, she only did things her way. And she made England the richest country in the world at that time… In the mid to late 1500’s. The film did get a little boring at times, but overall, I liked it and I’m giving it 3 out of 5 stars on the Netflix grading scale. After I write up this update, I’m headed back in the house for The White Countess. I have no idea what the film is about and I think that I put it on my queue just because another friend of mine chose it. I’m pretty much open to their ideas and I’ll give just about anything a try. I’ve also started doing something that I haven’t really done in a long time… I’ve started reading again on a regular basis. I get the daily news, but I’ve been receiving books for birthdays and Christmas in which I never read. So I’ve decided to round myself out by reading at least 20 pages everyday. And by reading, I may just get a little better with my writing skills. I finished The Da Vinci Code last week in order to see the movie tomorrow. And as soon as I find out how to do it, I’m going to rip off something that Jeff Kay does on the West Virginia Surf Report… He always posts a picture of what’s on the Surf Report nightstand in the side bar. And as much as I hate to do it, it seems that I have to find a book on HTML in order to do it. Oh! By the way… I was outbid on the props from the Malcolm in the Middle television series. I could only go as high at $80 and here’s what I was bidding on. Just cut and paste the damn thing if you wanna see it. I tried using the "insert link" feature on the Blogger.com template and had absolutely no luck. You see... I is ignorant. I hate to say "I told you so" (OK, not really - I love saying that), but I knew you wouldn't win. I'm frankly surprised the winning bid was as low as it was. People pay *stupid* amounts of money for TV show props when a series is ending. You know Christine... I had no hopes of winning it, just a slim one. But I know if I ever get cancer with a slim chance of surviving, NOT to accept visits from you.